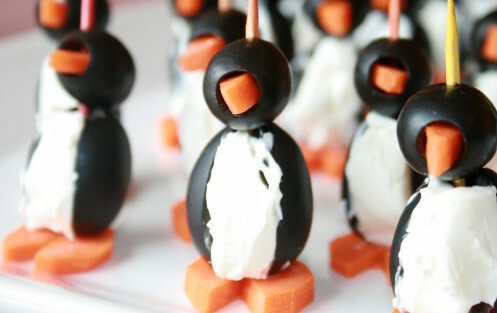 Many months ago I found these adorable penguins when I was gawking at foodgawker. It was love at first sight. I couldn’t wait until my next party so I could make them.Â Luckily for me my penguin loving daughter was having a birthday party. These appetizers were a hit, and they sent the cute factor through the roof. All you need is two different sized pitted olives (I used jumbo and small), soften cream cheese, whole carrots, and toothpicks. With a little time and effort you too can have an appetizer that will be a real ice breaker at your next party. Sorry for the cheesy pun, I couldn’t resist. Drain the juice from your olives. Peel the carrots and slice into coins. Take the jumbo olive and cut out a small wedge. Cut a small triangle out of the carrot coin. The triangle now becomes the penguin's beak. Insert the large end of the triangle into the opening of the small olive. Place the small olive on top of the jumbo olive, secure with a toothpick. Place carrot coin on the bottom of the jumbo olive, pushing the toothpick far enough in so it pierces the carrot. 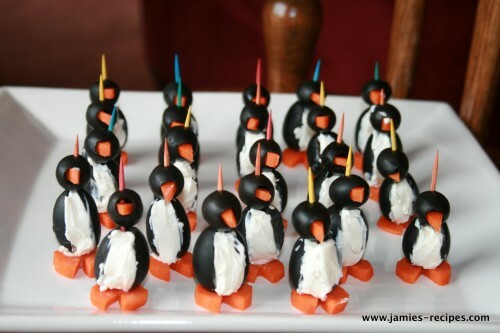 Line up the penguins on a platter for an adorable penguin army. Enjoy! I remember seeing those last year too. SO cute! How cute!!! Will see if the gluten-free boy would wanna make penguins. Keep up the great blog! I LOVE your cinnamon rolls. I have even had a request for the recipe so sent the German girl to your blog. I will have to ask her if she ever made them. I knew I seen some yummy looking gluten cinnamon rolls on a blog but could not remember where. The boy will be super excited when we make these!! Can’t wait to have kids just to have a reason to do things like this! I love penguins. I collect penguins. I imagine if you use a small piping bag for the cream cheese, the process will go a bit faster and the centers of the tummy will look a little cleaner. CAN’T WAIT to make these! 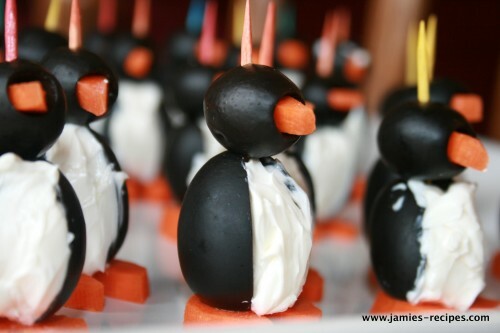 I love this idea and I have made them before for my friend’s birthday (she loves penguins) but taste wise, you may want to try the feet and mouths with chedar cheese instead of carrots… tastes a lot better!! Thanks for the suggestion Ana, my daughter loves carrots (she eats one everyday!) so the carrots worked perfectly for us. However others may want to try the cheddar cheese option!